Spring is here and after a long cold winter we’re all excited to get outside and get active. Spring is also a great time to do a little “spring cleaning” of our diets and get back to basics like healthy, delicious foods like Eggland’s Best. For many of us rethinking our diet can be a daunting task. 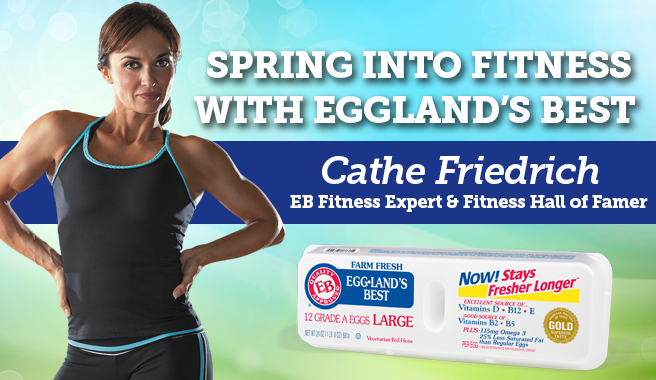 The good news is Eggland’s Best fitness expert and National Fitness Hall of Famer, Cathe Friedrich is here to help you jumpstart your spring! Prime your metabolism from the get-go with an Eggland’s Best high-protein breakfast. Your body burns more calories digesting a protein-rich meal than a meal high in carbs. It’s a small difference that adds up when you do it consistently. Plus, starting the day with protein will reduce your appetite later in the day. Think an EB omelet not a bagel! Core training requires a balanced approach. With so many muscles making up your core, abdominal crunches alone won’t cut it. Instead, focus on doing a variety of abdominal exercises including planks, side planks, bicycles, leg lifts, flutter kicks etc. followed by exercises that target your back. Training the core muscles in the front without attending to the ones in the back will create a muscle imbalance that leads to performance problems and, potentially, injury or back pain. Supermans (back extensions) are an effective exercise that targets back muscles. Other back exercises to add to your core strengthening routine are good mornings, bridges or bird dogs. Is it Time to Change Your Workout Routine? Exercise should be routine in the sense that you make the time each day to do it. Having a set time to exercise helps you stay on track and avoid missing workouts. But sometimes a routine can become a bit too routine. Spring is a great time to shake things up a little. With so many ways to get a heart-pumping, muscle-defining workout, you’ll never run out of ways to get and stay fit. Look at your workout routine with fresh eyes this spring. Even better keep a fitness journal so you can more easily see when you need to make changes. You have so many options for getting and staying in shape. Take advantage of them. Your muscles need adequate carbohydrates to replenish glycogen stores after a workout and protein to repair microtears that form in muscles during training. Training in a nutritionally-depleted state limits strength gains and increases the risk of injury. Make sure you’re getting enough calories, protein (like you find in Eggland’s Best eggs) and carbs to compensate for the extra stress you’re putting on your body. Give your muscles the nutritional support they need to grow and become stronger!